Website makeover for the Johnston Team of Barrie, ON. Wider look. Improved Call to Actions. Larger featured listing photos and a footer for easier navigation. Uses the Ubertor CMS. 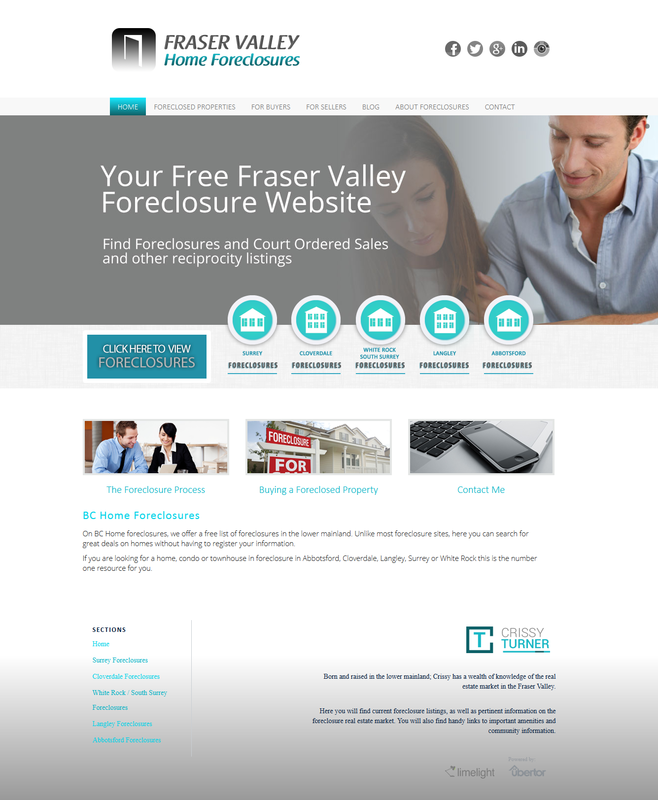 This is a new niche website for Realtor Crissy Turner targeting foreclosures in the Fraser Valley. It uses the Ubertor platform and it is designed to get visitors easily to what they came to see. New website using the Ubertor platform for Realtor Heather Forman and her team. They specialize in helping buyers and sellers with the purchase and sale of residential property in the Langley area, but they also work with buyers and sellers of homes, condos and townhouses in other areas of the Fraser Valley. Clean, bright and easy to navigate. Click here to visit. 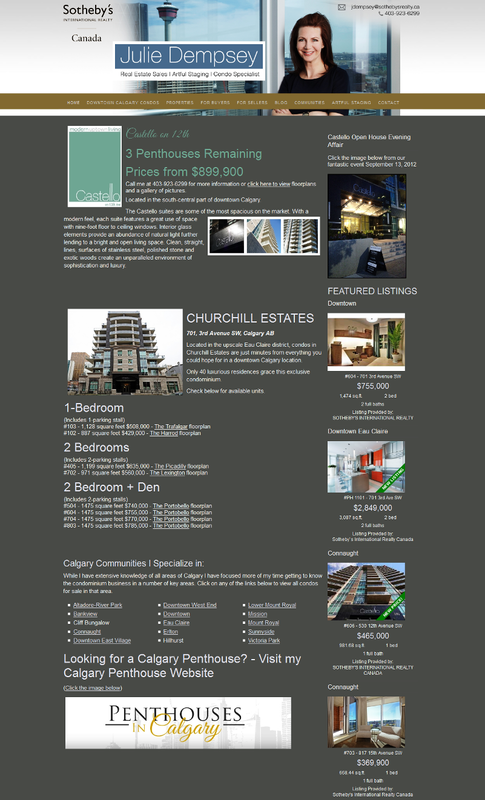 This is a new website for Julie Dempsey a condo and penthouse specialist in Calgary, AB. Designed to be a resource for people buying and selling pre-sale and pre-construction condos it features a clickable sliding banner that is the first of its’ kind. Also has a great clickable map for finding buildings. Check it out by clicking here. Darlene Abenante and Ron Allibone are a husband/wife team focusing on real estate in the West Kootenay area of British Columbia, one of the most beautiful and scenic areas in Canada. As they specialize in real estate in Trail, Warfield, Salmo, Montrose and Fruitval, BC we had to make make it easy for visitors to view listings for each area and learn more about each area so we set up 8 clickable links to each area. The website also displays 4 featured properties on the home page and 3 more Call to Action buttons help visitors even more. The website design focuses on making it easy for visitors to view their listings and search for homes, condos and townhouses for sale in the Lunders’ key areas. The Call to Action icons have a unique mouseover action which reveals a photo of the area. We have also added icons so visitors can drill down to the area and type of real estate they are interested in. 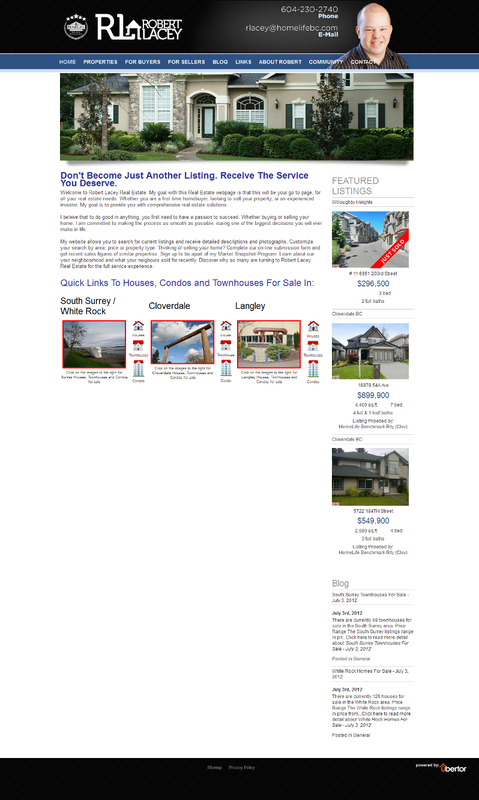 This is a new website we designed for Bernadette Dunnigan a Realtor in North Vancouver. It uses the Ubertor Content Management System. 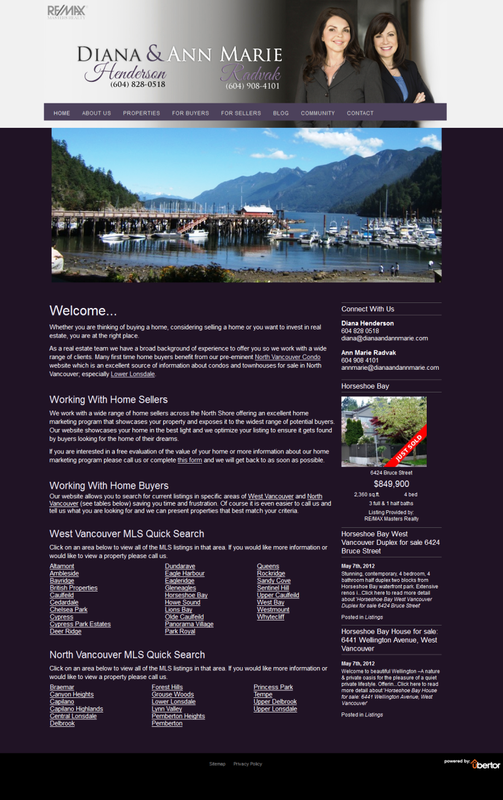 The website is designed to be a resource for buyers looking for home in the Edgemont Village area or by price range throughout North and West Vancouver. There are four Call to Action buttons to guide visitors to the main pages. 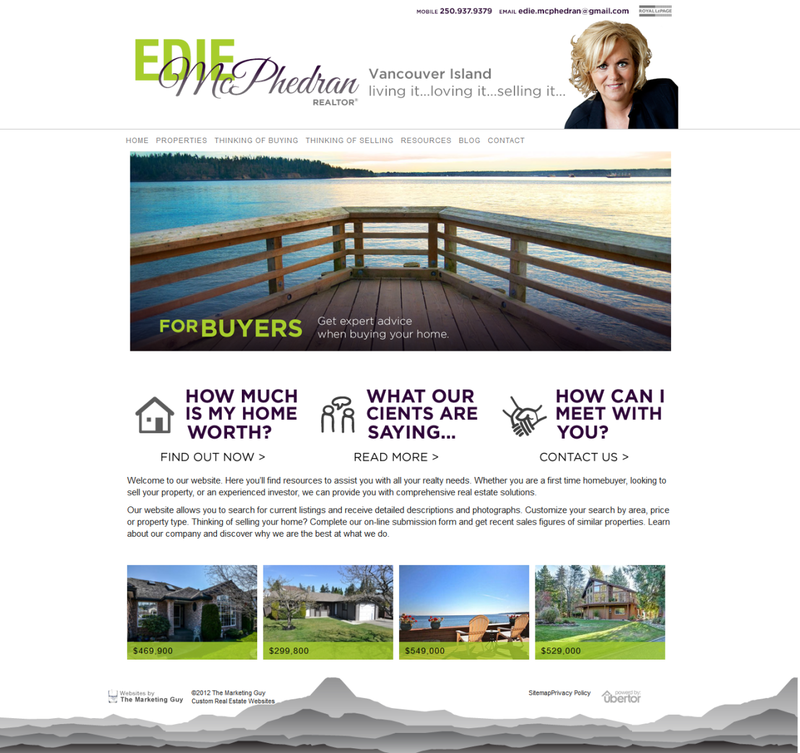 We just launched this new custom website for Edie McPhedran using the Ubertor platform. In addition to the new website we created the branding for Edie including a slogan, business card, trade show poster and trade show banner. The website has been completely optimized to get it to page one of a Google search. Call Mike Blaney at 604-618-5512 or 800-568-8338 for more information. 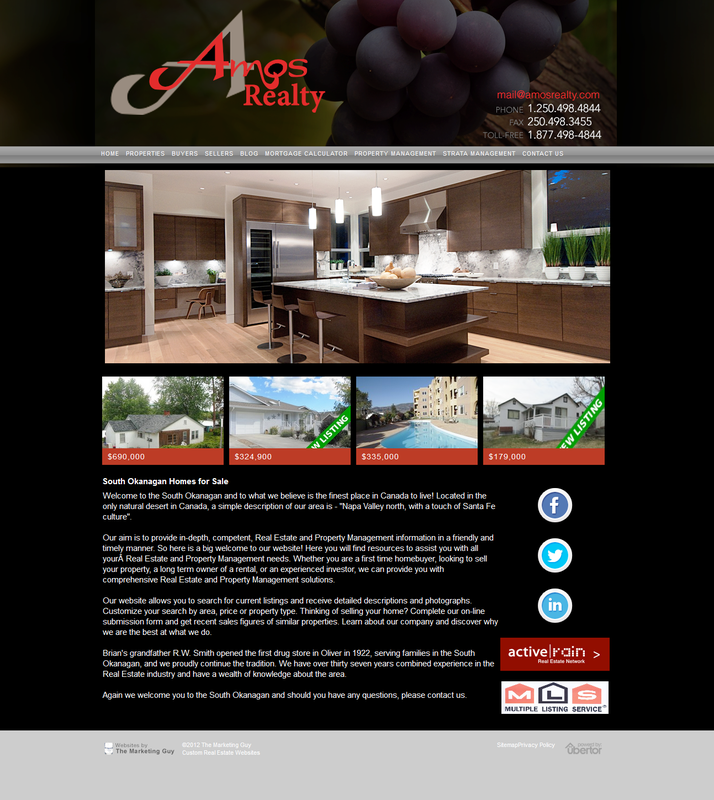 This is a new semi-custom website we just created for Amos Realty of Oliver, BC. It uses the Ubertor platform. 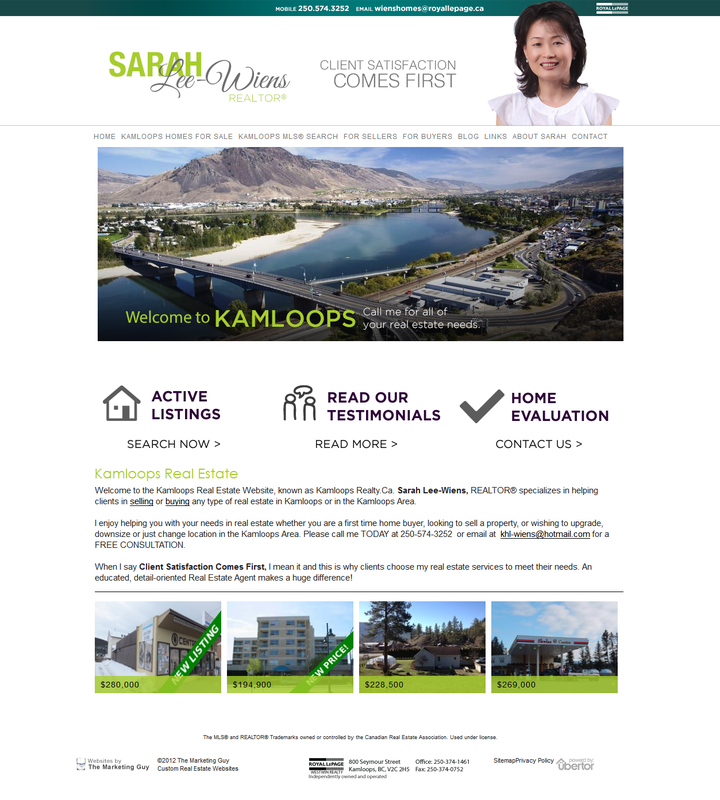 Sarah Lee Wiens originally contacted us to improve her search engine optimization and ended up with a new website as well. After all, once we optimize a website and it gets to page 1 more people are going to visit and it has to look nice! You can see Sarah’s original site below. As part of the new website we created new branding and a new look that we will help Sarah implement throughout her marketing. From an SEO perspective we optimized all of the website Page Titles and Descriptions and added a number of keyword blog posts. We also link to her website from this website and a number of others which helps her rankings. The theme that runs through all of our websites is to create an eye-catching, easy to navigate website with attractive, informative banners, specific “Calls To Action” to direct visitors and eye-catching featured properties. If you are interested in a new or revamped Ubertor website please contact Mike Blaney at 604-618-5512 or 800-568-8338. If you want to dominate a market in real estate you need to be the community expert and Morgan DuVernet and Kelsie Struch are doing just that on Marine Drive in North Vancouver. 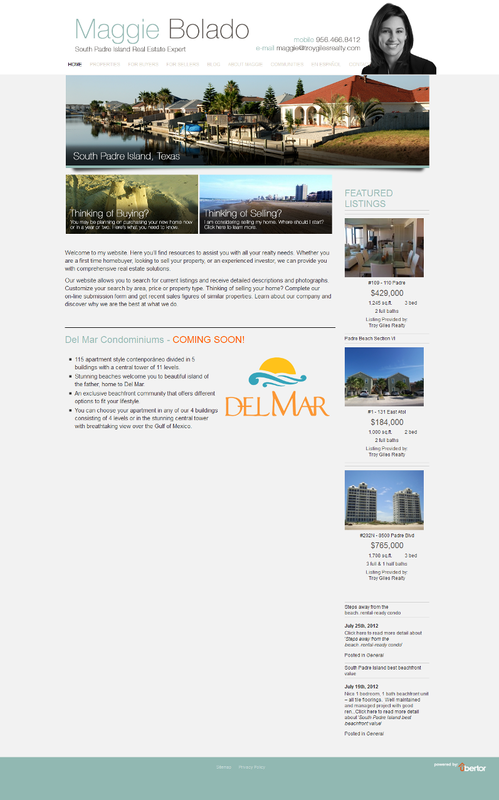 They asked us to create a website and branding specific to condos for sale on Marine Drive in North Vancouver and phase 1 of www.marinedrivecondos.com is complete. We have added easy search capabilities and the website is updated automatically with new listings in this area. Extensive building information and floorplans are on the website and in phase 2 we will add more community information. If you are thinking of a new website or upgrading yours please contact use at marketingguy@shaw.ca or call us at 604-618-5512 or 800-568-8338. Anna Terrace is a Realtor® with Homelife Benchmark Realty in Cloverdale. Anna was referred to us by another client Natalie Gauvreau. Never one to back down from a challenge we have accomplished the first two objectives and now we are optimizing the website and working on organic search engine optimization techniques that will move the website up in search rankings. 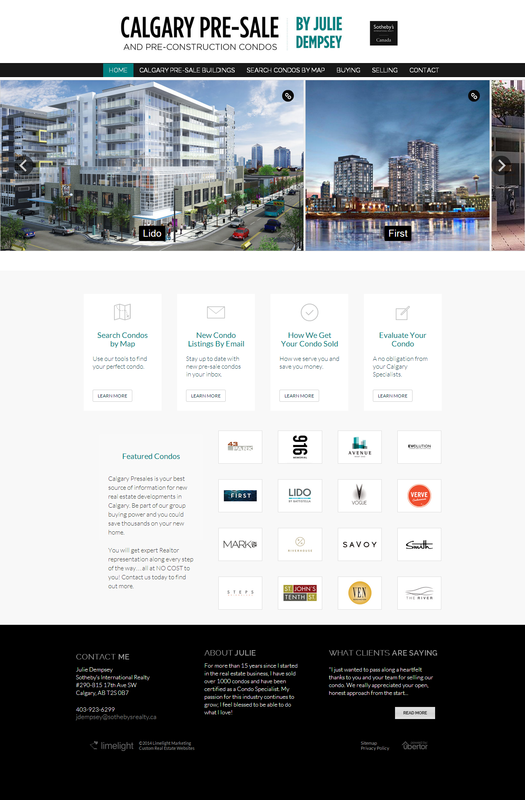 Our client Julie Dempsey, a Realtor and Condo Specialist with Sotheby’s in Calgary wanted to update her Ubertor website to look more like the recent website we completed for her featuring Calgary Penthouses for sale. After selecting the colour pallete and choosing the right photo of Julie we revamped her website overnight. We also optimized all of the page titles and descriptions to improve the search results. 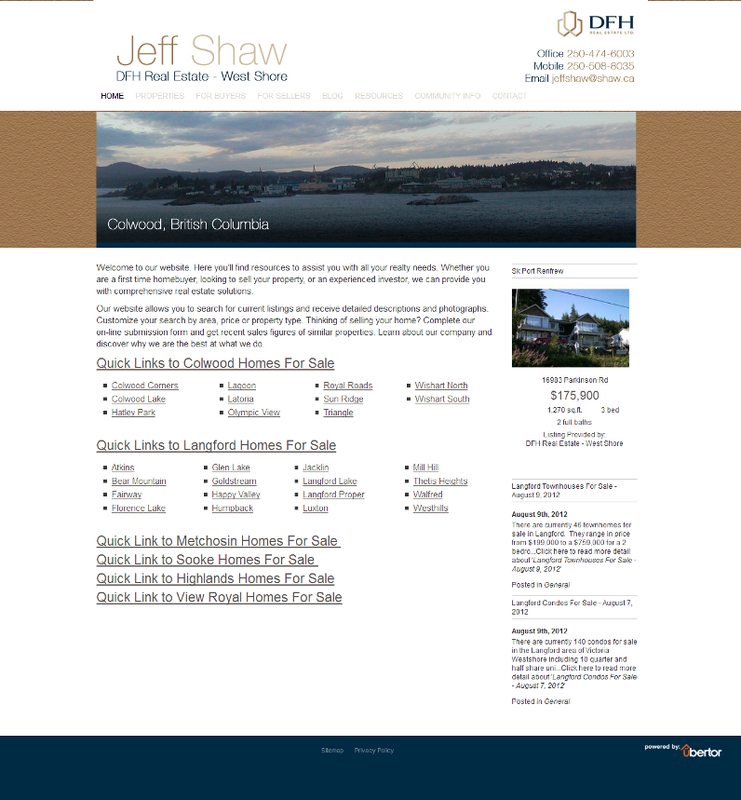 Announcing this new website for Jeff Shaw a Realtor with DFH Real Estate, but Jeff is excited to start working his way to page 1 of a Google search for Colwood and Langford homes and condos for sale. We will be adding new banners shortly, but in the meantime this website has all of the bells and whistles that separates it from the other websites. It offers visitors access to every home, condo and townhouse for sale in Colwood and Langford, but it also has a lead capture system through a registration step. (which is required by the Victoria Real Estate Board). We have added 6 keyword blog posts to kick start his SEO and optimized every listing, Page Title and Description. Check back soon for the finished product. 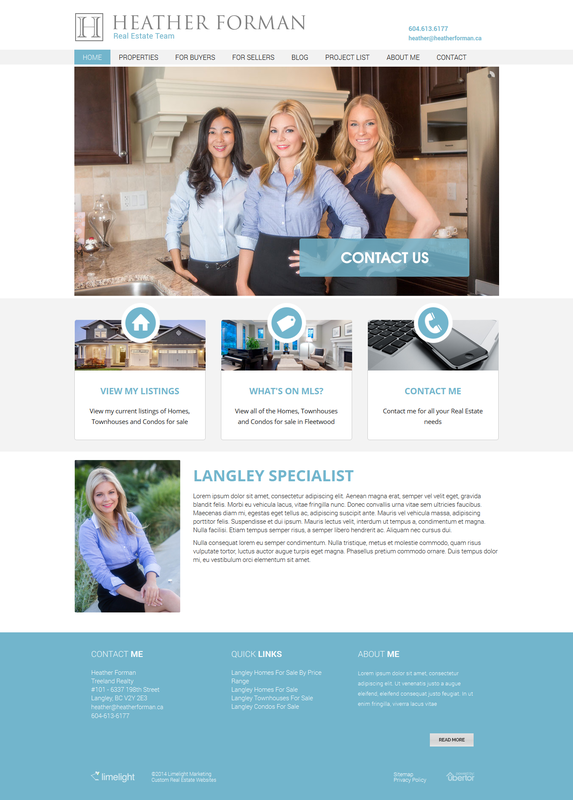 If you are a new Realtor needing their first website or want to change your website to a more contemporary look that search engines actually find please call us at 604-618-5512 or 800-568-8338. 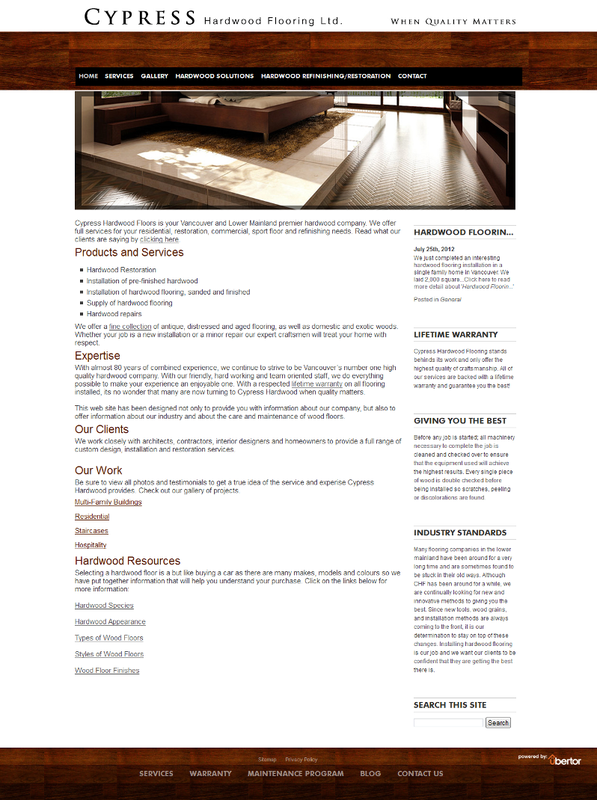 We just completed a new website for Cypress Hardwood Floors. Their original website was written in html and could not be updated easily. A static website is not likely to rank as well as a website that is changing regularly so the Ubertor platform allows Cypress to add new products, add testimonials from clients and write about their projects. As usual we optimized the website to give it the best chance possible to be found on page 1 of a Googe Search for search terms like Vancouver hardwood installation or Coquitlam hardwood sand and refinish. Cypress Hardwood floors is your Vancouver and Lower Mainland premier hardwood company. They offer full services for your residential, commercial, sport floor restoration, repair and refinishing needs. We just completed this new Ubertor website for Robert Lacey a Realtor with Homelife Benchmark Realty in the Cloverdale area. 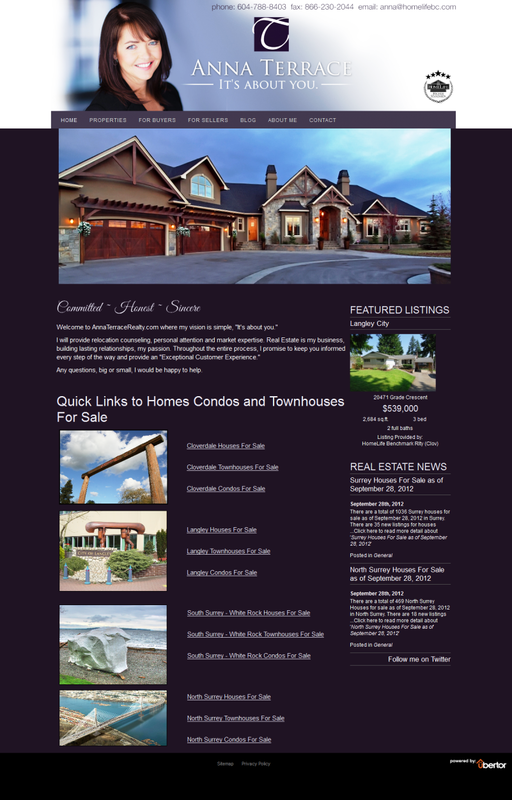 Robert’s website has been designed to make it easy for visitors to view homes, condos and townhouses for sale in Langley, Cloverdale and the South Surrey / White Rock areas with clickable links on the home page taking visitors directly to what they are looking for. We optimized the website so it will have great search engine results and added three keyowrd blog posts to ensure the right content is on the website. Rebecca Williams is a Realtor with Coldwell Banker Beverly Hills specializing in the Bel Air, Holmby Hills and Beverly Hills real estate markets. Rebecca is in a competitive market and she needed a website that would make her stand out in the crowd so we created this fabulous new website for her. 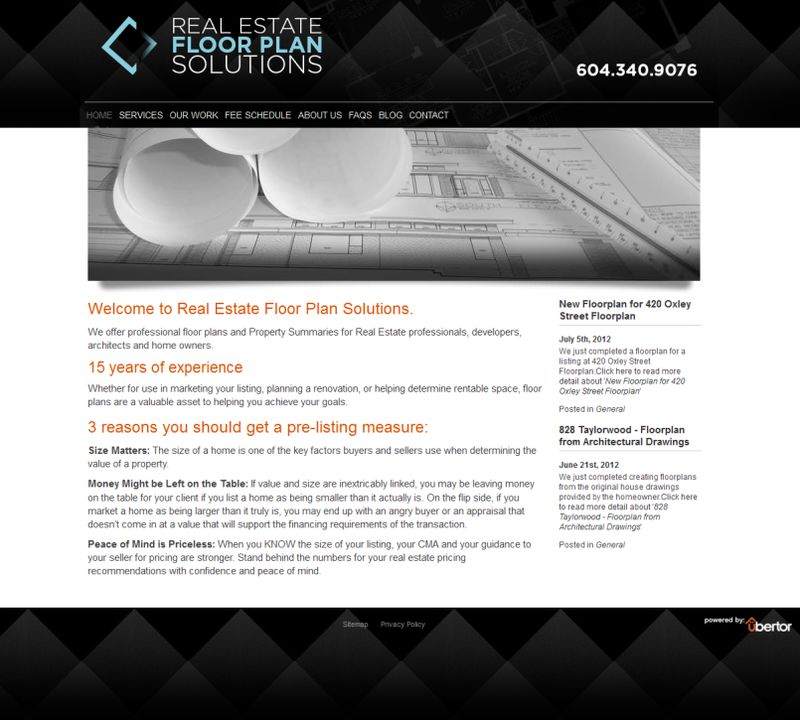 We not only created this sharp new website for a new company called Real Estate Floorplan Solutions, we developed all of their branding, marketing plan and collateral marketing materials. This new Ubertor website was designed to be clean and simple making it easy for Realtors, Developers. Architects and homeowners to find the information they are looking for. As part of the marketing strategy we developed a unique way of pricing floorplans using ranges than a price per square foot method. For example all floorplans for homes between 4,000 and 5,000 sq ft are $299.00. The rationale was that the square footage might be greater, but the time to measure and draw was about the same. Tyler Scott called us and asked us to create a new logo for his company Modern Calgary and we suggested how about a new website to go with it? Here is the result in only a couple of days. 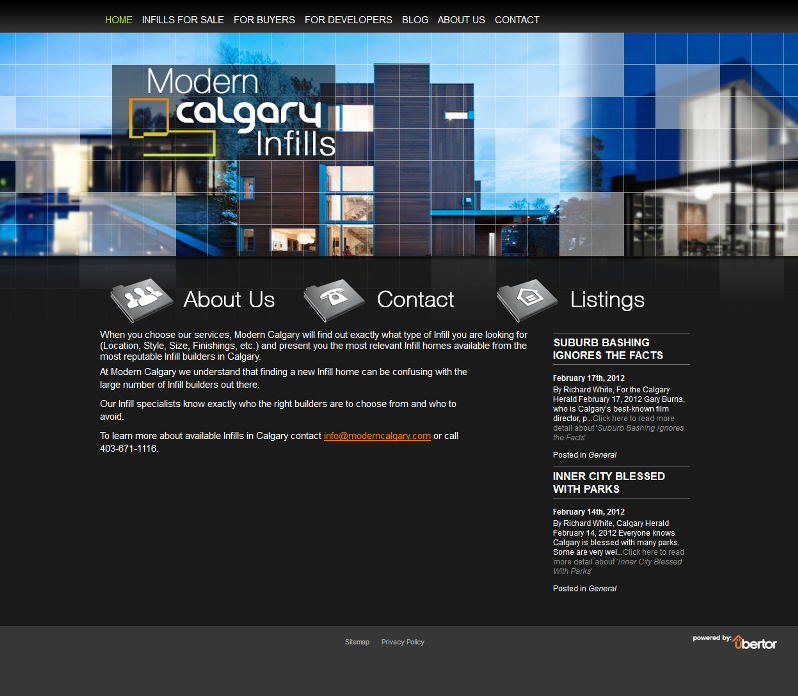 www.moderncalgary.com. It is hard to believe this website uses the Ubertor template and what is even better is the website only costs $1.00 for the first 4 months and then only $17.00 per month thereafter without a contract. That includes the hosting and Ubertor’s great Live Support. No matter what business you are in we can provide a cost-effective website that will make heads turn. Who is Modern Calgary? Specialists in the marketing of infill homes in Calgary. “When you choose our services, Modern Calgary will find out exactly what type of Infill you are looking for and present you the most relevant Infill homes available from the most reputable Infill builders in Calgary. At Modern Calgary we understand that finding a new Infill home can be confusing with the large number of Infill builders out there. 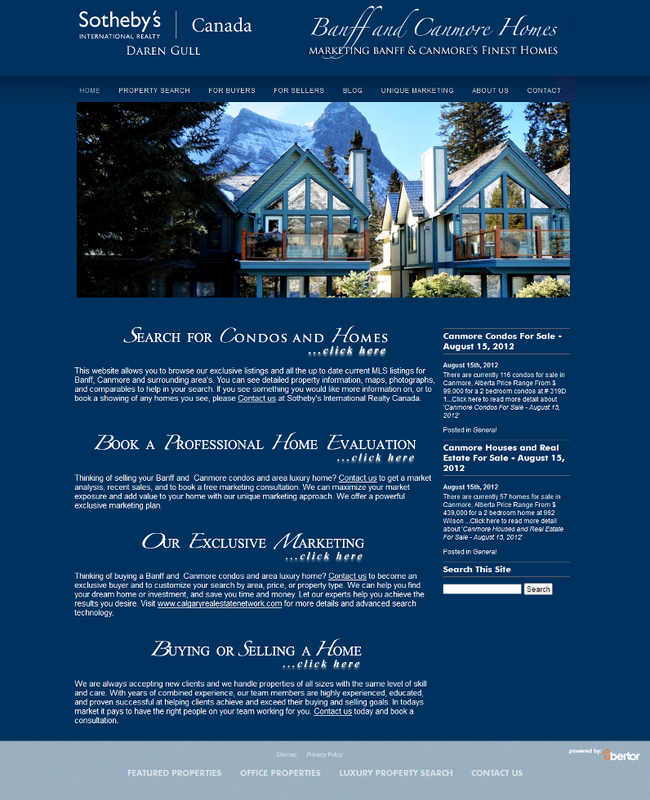 Our client Daren Gull of Sotheby’s Calgary and the Realtor behind the website we created last year www.luxuryincalgary.com is branching out into the Canmore and Banff areas and wanted a website that would make an impact so we created www.banffcanmorehomes.com. Give us a call if you are interested in a new Ubertor website or would like to remodel your existing website. Diana Henderson and Ann Marie Radvak are a newly formed Realtor team with REMAX Masters Realty in West Vancouver. Here is their new Ubertor website. We were asked to provide a total branding and marketing package including email stationery, stationery, collateral marketing material, custom mobile website and of course an Ubertor website. We added about 24 auto-fill categories and optimized the website for search engines. We just completed a new Ubertor website for Maggie Bolado a Realtor with Troy Giles Realty in South Padre Island, TX. 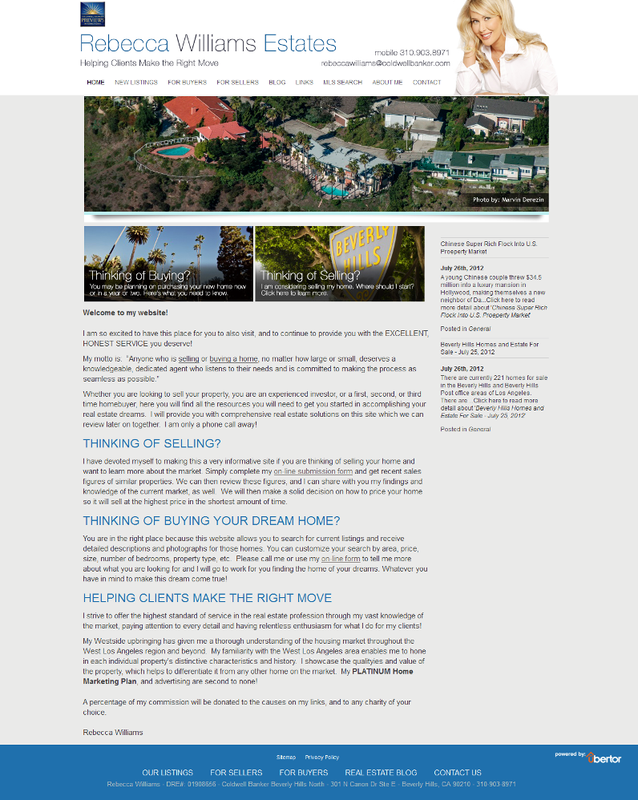 The site has a light grey background and a white masthead to give it more of a light, “beach” feel. There is more work to be done, but this new Ubertor website is already making a difference for Maggie’s business. The Bergg Homes team has recently joined RE/MAX Kelowna and wanted a new website that would single them out as market leaders and showcase their listings. We added 60 recent sales and 39 active listings and then activated the Ubertor Listing Category feature to make it easy for visitors to find a home in the area they are interested in. We optimized more than 30 pages of their website for search engines and added keyword blog posts to both inform visitors and attract search engines. Working with Steven and his team was a great experience which I am sure would be the same for a buyer or seller too. If you are interested in a new or upgraded Ubertor website please call Mike Blaney at 800-568-8338 or 604-618-5512. P.S. The black area at the bottom is a YouTube video.